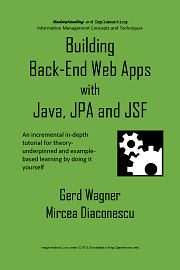 Please support web-engineering.info and buy our e-book Building Back-End Web Apps with Java, JPA and JSF. This tutorial book is available as an open access online book (HTML) and as an e-book (PDF) via its book webpage. This book, along with any associated source code, is licensed under The Code Project Open License (CPOL), implying that the associated code is provided "as-is", can be modified to create derivative works, can be redistributed, and can be used in commercial applications, but the book must not be distributed or republished without the author's consent. Revised part 1, added practice projects. 10.1. Question 1: Meaning of "one-to-one"
10.3. Question 3: Meaning of "Functional"
3.1. The object type Book. 4.1. The object type Movie. 7.1. The object type Movie defined with several constraints. 10.1. The object type Movie defined together with two enumerations. 11.2. A committee has a club member as chair expressed by an association end with a "dot"